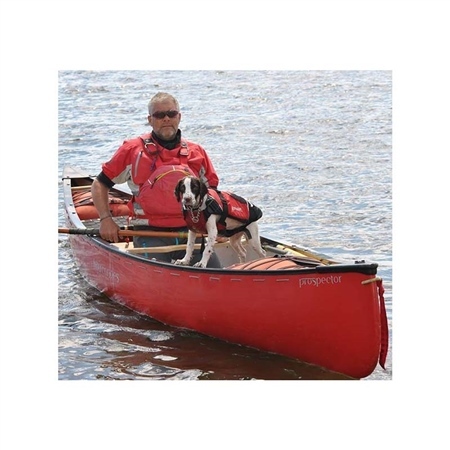 WS600130 Red Canoe comes with kneeling thwart, end bag, buoyancy blocs and drop-in seat. The Chestnut Prospector is a design legend and the hōu Canoes take on an all-time classic retains all the best characteristics of this all-round boat. This canoe was originally designed as a trading vessel so had to paddle well on both open water such as lakes, and also to paddle well on moving/white water rivers. It had to paddle well unloaded but also had to be able to carry a good load on the return journey. Today we still want the same from our canoes, all be it for different reasons. This boat is a joy on lakes and rivers, and will give you a dry, predictable ride whether you are solo or loaded up for a multi-day trip. This classic design is all things to all paddlers, the ultimate all-rounder. With the boat being pitched at just over 15 and 1/2 feet in length it is considered as the ultimate do everything boat. The 15 is what you may want to consider for solo paddling, and the 16 will be better for tandem and tripping days. If you are looking for a single all in one boat, the hōu Canoes Prospector is going to be the perfect choice.